An excerpt from Victor Navasky's The O'Dell File reveals the story of the civil rights movement's 'unsung hero' who has been wrongly written out of the pages of history. The following is an excerpt from Victor Navasky's The O'Dell File, a new Amazon Single. Many of those most intimately involved in the black freedom movement from the late ’50s forward have called Jack O’Dell its “unsung hero.” Yet, most Americans have never heard of the man or his many accomplishments. By disqualifying O’Dell from playing a public role in the national conversation, from being an open and visible contributor to the policy debates that help define and comprise the public sphere—as the FBI, the Kennedys, and Martin Luther King himself did in the early 1960s—we have inflicted an unnecessary and grievous wound upon ourselves, our country, and our culture. I first came across Jack O’Dell’s name in 1969, in the attic of Burke Marshall, Robert F. Kennedy’s former assistant attorney general for civil rights. Let me explain: Since 1964, when Robert F. Kennedy had resigned from the Justice Department and was elected senator from the state of New York, I had been working on a book about his attorney-generalship. Although many of the alumni of the Kennedy Justice Department were still in the Washington area, many were not. Burke Marshall, for one. He had resigned in 1965 and was living in Bedford Hills, New York, where his papers resided in the attic. So every weekend, I would install myself in the Marshalls’ attic. Burke would come up from time to time and, laughing nervously, would ask what I was doing up there since there could be nothing of interest. Then we would have dinner and discuss what I had discovered. The conversations were invaluable because they gave me a chance to get this thoughtful man’s opinions on everything from federalism; to the role of the FBI; the March on Washington; and Robert Kennedy’s evolving commitment to civil rights and how that expressed itself in terms of his relationship to his brother and after JFK’s assassination; President Johnson; and much, much more. One weekend Burke told me that he and his wife, Violet, were going to be soon taking a vacation, but I was welcome to make my weekly pilgrimage. As it happened, that weekend there was a blizzard so great that I got snowed in and was forced to stay the night. I spent that night in the attic, where I buried myself in Burke’s correspondence and memorandums. At 2:30 in the morning, I came across a sealed file. There was no indication on the outside what the file contained. What to do? I could wait until Marshall returned and ask, but since it was 2:30 in the morning, since I was there and he wasn’t, what else could I do? After weighing the ethical pros and cons (for about 30 seconds), I carefully unsealed the file and found copies of a series of memorandums, the first of which said that J. Edgar Hoover, the director of the FBI, had requested the attorney general’s authorization to tap the phone of Martin Luther King, Jr. 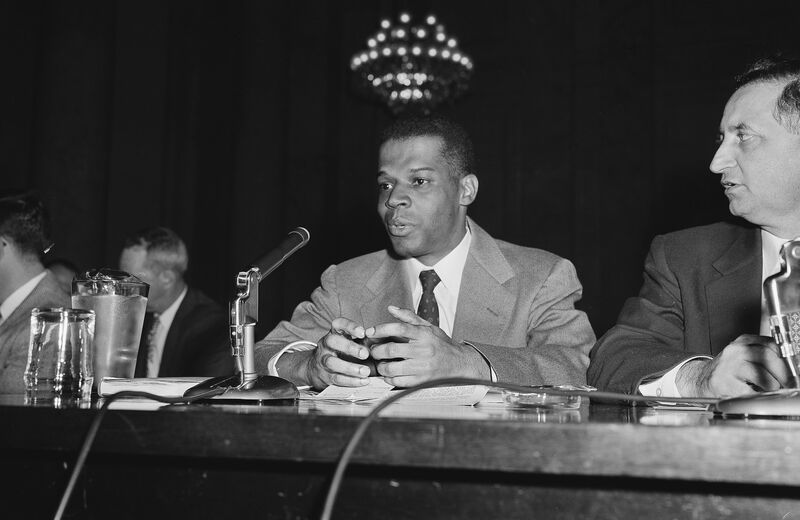 The basis of the request was that there were two high-ranking members of the Communist Party in Dr. King’s entourage: one, a New York attorney named Stanley Levison, and the other, Hunter Pitts (Jack) O’Dell, an African-American who, at Levison’s suggestion, had been hired to run the Southern Christian Leadership Conference’s (SCLC) new direct-mail fund-raising office in Harlem. The purpose of the wiretap was to monitor Dr. King’s conversations in order to discover whether Levison and O’Dell were attempting to influence Dr. King and the civil rights movement on behalf of the USSR. O'Dell had a fascinating history, before, during, and after his Communist Party period: As a merchant seaman he was elected by his shipmates to go to NMU’s labor school. As a petition-gatherer, he invoked his college fraternity network to collect a record number of signatures. As a first-time benefit fund-raiser, he raised more than half of SCLC’s budget for the year. Lacking a college degree, he was the most popular professor in Antioch’s Graduate School of Education. As aide to Rev. Jackson in the 1988 presidential campaign, he was put in charge of the “foreign desk.” An insider reports, “he was instrumental in Jackson’s positions on Latin America, Cuba, South Africa, Palestine—essentially all of those that mattered most to the constituencies the campaign was trying to put together.” All of the above, he operated coast to coast (on Long Island, he received the Lifetime Achievement Award and in the state of Washington, he has the Jack O’Dell Center for Reflection and Education named after him). Whatever he was, Jack O’Dell was as far from the Hoover-McCarthy-inspired caricature/stereotyped image of a Red—an unthinking, party-line Stalinist—as it was possible to be. In fact, if anything, he was the citizen (albeit with a Marxist orientation) all thoughtful theorists of democracy hope for when they make the case for government of, by, and for the people. O’Dell’s is a cautionary tale. Although he himself never turned bitter, never despaired, never gave up, we—our state, our democracy, our country—disqualified him from full participation in our national conversation, our policy-making process. Might such high-visibility participation have resulted in the rest of us seeing things in a new, worldwide perspective? We will never know. The larger question his life story poses is, How many other potential enrichers of our democratic dialogue did we miss out on because of the domestic cold war and attendant anti-communist hysteria? And if there are no others like him, more’s the shame and more’s the pity.